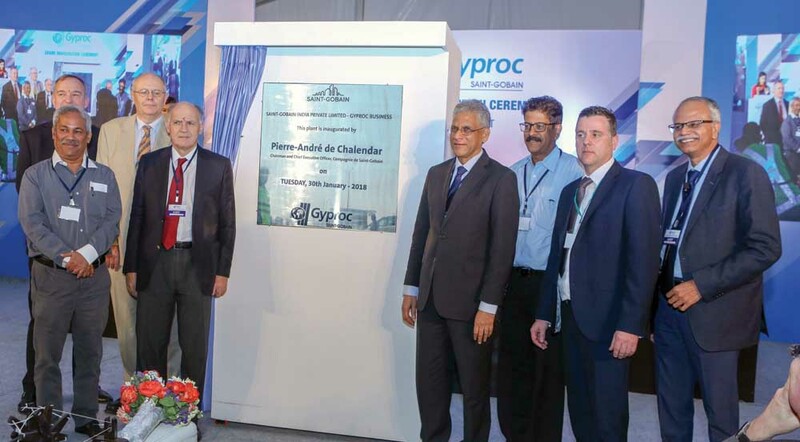 Construction products major Gyproc India, part of Saint-Gobain Group, has inaugurated its largest plasterboard manufacturing facility at Jhagadia in Gujarat this January. Saint-Gobain chairman and CEO Pierre-Andréde Chalendar inaugurated the new manufacturing plant, which is projected to be India’s largest gypsum-based plasterboard manufacturing facility with annual capacity of 30 million sqm.The company has invested Rs 350 crore to set up this facility, while it also has plants in Haryana, Maharashtra and Karnataka. In line with the government’s focus on rejuvenation of existing cities and urban areas as part of its urban development mission, Saint-Gobain’s Gyproc business in India is taking the lead in offering efficient and green construction solutions and has already gained a strong foothold in the construction market. Speaking on the development, Anand Mahajan, general delegate, Saint-Gobain Group in India, said,“India is amongst the best performing regions for Saint-Gobain and it has been our constant endeavour to develop the markets by bringing the best technologies and building world-class manufacturing facilities, in line with the government’s ‘Make in India’ mission.” Over the years, said Mahajan, the company has made significant investments across all its businesses – Glass for Buildings and Automotive, Gypsum Plasterboard and Plasters, Abrasives, Ceramic Materials, Performance Plastics and so on. “Today, more than 95% of our local sales are from products manufactured in India. We believe that our Gyproc business has the potential to play an important role in shaping the future of the Indian construction landscape. The Jhagadia plant is our 22nd manufacturing entity in India and will help us further strengthen our leadership position in the gypsum industry,”commented Mahajan. Added Venkat Subramanian, regional CEO-construction products and Gyproc India managing director, “As a pioneer in the gypsum industry, our Gyproc business in India has been at the forefront of developing the construction market through end-to-end design and system capability, innovative products and solutions.” According to Subramanian, the company has been dedicatedly working towards creating new categories in interior spaces through smart marketing campaigns and continuously building awareness through close engagement with architects and contractors. “Over the past decade Gyproc India has successfully created a robust distribution network and our strategically located Jhagadia plant will help us serve our customers across India more effectively,” he said. On the skilling front, Subramanian shared that Gyproc India is an active contributor to the Skill India initiative and that it partners with training institutes to address the skill gap by creating employable high-quality workforce. “As a market leader, the Gyproc business is committed to grow the gypsum industry through its market development efforts, distributed manufacturing footprint, innovative products and solutions, skill development, research and development and superior customer service,” averred Subramanian.